It is difficult to improve the quality of construction works, but it is possible to improve the client’s perception of the company in 5 minutes. Give a manager an iPad with an e-catalogue of flats and send them to consult clients in the queue. They will remember this service for a long time. It will be possible to reach your sales office by phone after 5 pm and on Saturdays, since our products make remote working available. Pick an employee who will be consulting clients in the evenings from home and receive 20% more requests. A caring employee anticipates, makes offers, asks about opinions. He or she communicates with each client dozens of times. We designed our products to make such a level of care available with every manager servicing 150-200 persons. When your sales office receives a call, your managers will not have to find out the same information all over again. They will be able to see all information and a complete history of cooperation right in the system. The apartment catalog is the heart of our systems. Each developer’s apartment catalog has two views, a public and a private one. The private view allows to see all apartment statuses and leads interested in them. The public view is designed for incorporating information on websites and transferring it to real estate agencies and partners. Have a look at how it works. Separate field to log meetings is required aside from lead status for correct functioning of your sales funnel. Our systems provide long status names that will be clearly understood by managers. Excluding all booking-related stuff off the sales funnel helps to maintain system order. As well as status grouping, which is supported out of the box. The software tracks bookings within the system, notifies managers about the upcoming cancellations, automatically cancels outdated reservations everyday. Inviting clients to sign agreements. Reminders about late payments. Target-focused, quick, effective. Specify number of bedrooms, or client’s budget and the software will find all suitable units within a couple of seconds. Color-coding shows different availability, manager would also see what matches completely to the request, and what is “close match”. The system will find the lead record within a few seconds. It is one of the main differentiators of our products. How many people contacted us this month and purchased a flat under 40 m2? How many new leads were received for the facility ‘Panorama Nha Trang’? It is possible to work with such search results further on, for example, to make individual newsletters, follow-up calls. We dislike manual input as much as you do. This is why we designed our software to request as little information as possible from sales managers. related persons: family members, agents. Reassignments, terminations, additional work requests, equipment installations, agreements. All these are no longer on paper, they are in an electronic system. Receive reminders, easily control timely fulfillment of tasks. Easily find documents related to particular clients. The scanned copies you need are always at hand now. Use the data storage that you are familiar with: Google Drive, Dropbox, Box, FTP server. The real estate market is always dynamic, and it is important to get ready for recessions in advance. Appoint a position of the hotline administrator to one of your sales managers and hold a record of all calls to the company. By the next period of economic recession, you will have a database of potential clients to work with. Even in the times of crysis, your managers will not end up sitting in an empty office with nothing to do. Stop racking your brains trying to arrange a system for employee motivation. Our systems clearly shows which deals were facilitated by marketing and company reputation, and which worked out thanks to a hard work of your sales force. Reward employees for the deals they did hard work on. Chief personnel can easily see how many leads were processed by a each sales executive in a week/month. What sort of leads they were, their quality. Planned deals, signed agreements, factual down payments, terminated deals. You will be able to receive all this information from the system immediately. Check out some of the available analytic reports right now. No matter how your hotline is organized, our systems will function perfectly with them. Sales workflow is simple and error-free even without IP-Telephone integration. If you wish an additional convenience, our systems may be integrated with cloud-based IP-Telephone solutions. Smart tasks are ready filters displaying leads that have to be worked with in a particular way. We call them smart tasks because you do not need to assign them, they do it automatically, and also because they allow you to have leads in view. Our algorithm automatically determines the level of market demand for each flat based on buyers’ actions. Undervaluation of a few flats may lead to losses worth millions. Our algorithm helps to prevent this from happening. Liquidity analysis report provides you with a general overview of your business. See how your units were being sold over time and adjust your future pricing policy to maximize your profits. Add leads from your phone at once after receiving a call. You do not need to stay next to a computer all the time to work with EstOffice. 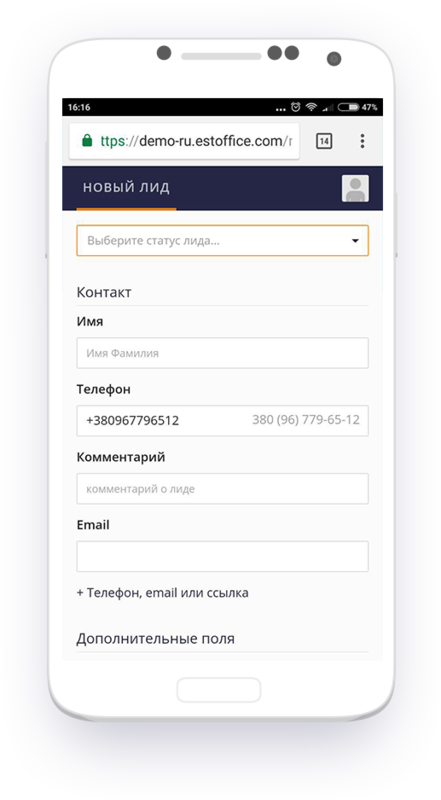 This function allows you not to lose a single call to the company using mobile connection. Even calls made to personal mobile phones of managers will end up in the system.